Determine the full name of the deceased, his date of death and his county of residence before death. This information is readily available for close relatives; refer to the obituary, phone books or the death certificate if the deceased is a stranger. Obtain a death certificate from the office of vital statistics in the jurisdiction where the death occurred. State real estate records, available in the recorder's office, aid in determining place of residence. Obtain free death information online from the Social Security Death Index (see Resources). Call the probate court in the county in which the deceased person resided prior to death. Ascertain the method used in that jurisdiction to locate probate records. Court personnel may direct you to an Internet site on which they post updated probate information, or to a dedicated phone life offering probate information. Alternatively, you might need to visit the court in person to review the file. Obtain and note the street address and business hours of the court. Go to the court during business hours. 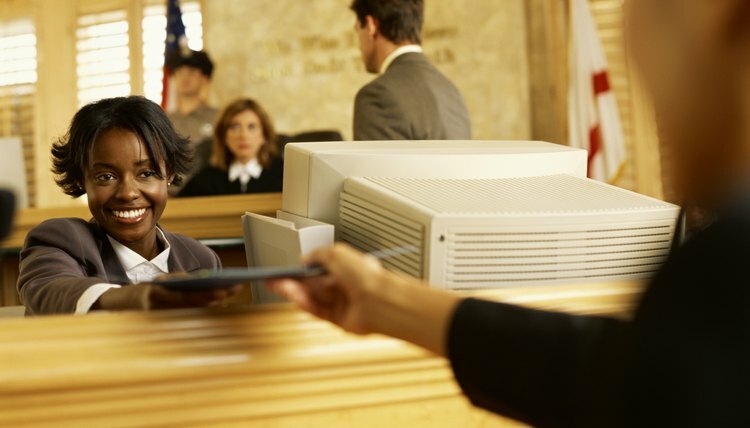 Locate the clerk in charge of probate records; in smaller jurisdictions, the same office treats all civil and criminal case files, but larger courts have separate family law offices. Provide the clerk the information you acquired including the name and date of death of the deceased. The clerk locates the probate file in the computerized index. If the judge's office checked out the file, ask when to check back. If the file is available, the clerk allows you to review it either at her window or in a reviewing area. Start at the beginning of the probate file. The executor filed the will early in probate to enable the judge to determine jurisdiction. Later documents indicate whether the executor proved the will to the court's satisfaction, that is, whether she offered proof that the testator signed the will in the presence of witnesses according to state requirements. The file also includes any will contest documents and the court ruling on the challenge. If the court accepts the arguments of a will contestant, the probate file contains either an earlier will filed to replace the invalidated will or else documents establishing that the estate passes to blood kin according to intestate statutes. Wills not only provide information about heirs and inheritance, but also help those tracing family history or establishing a chain of property ownership. Prior to a testator's death, his will is a private document and you "find" it only with his permission. The court does not open wills of a living person to public review even if the testator filed them with the court for safe keeping. From the date the court accepts a will for probate, however, the will becomes part of the court file and accessible to the public. The more recent the probate, the easier the will to locate. How Can I Get a Copy of a Last Will & Testament? Don't expect to see your grandfather's will while he is alive, unless he decides to show it to you. While the testator -- the person making a will -- is alive, his last testament is private and completely revocable. Your grandfather can change it on whim by writing a codicil or drafting a superseding will. However, when the testator dies, his will becomes effective -- and public. The court opens probate on the will and any member of the public can view and copy the document in the clerk's office.